This system is preoccupied with standardised testing and mandatory national exams, and demotivates children from learning. Instead, we nead a system that allows for students and teachers to shape bottom-up education in a way that their potential may be put to good use. This ‘Dutch DNA-based Education’, as we call it, will motivate students to learn. By doing so, we can create the optimal conditions for national as well as international progress. 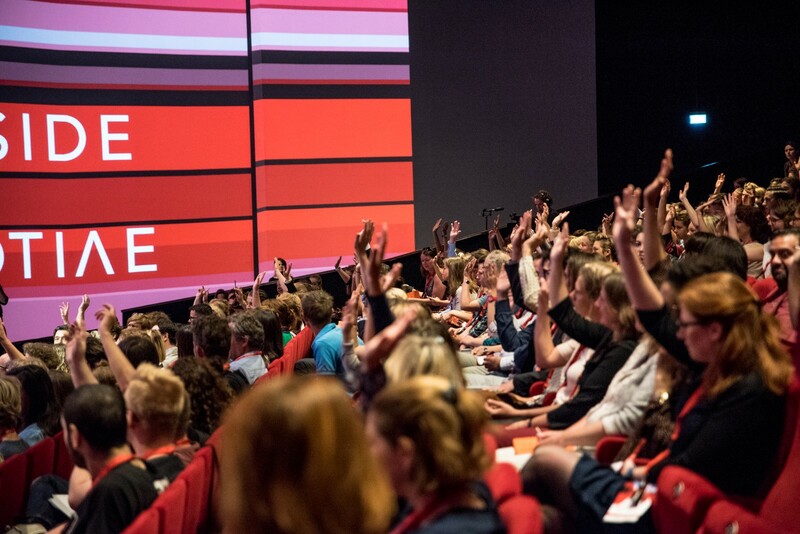 It is TEDxAmsterdamED’s goal to identify those characteristics in education that match our national identity, and to be a driving force behind Dutch DNA-based Education. Tickets for TEDxAmsterdamED 2018 Dutch DNA: Future Proof? Tickets sales are open. Get your ticket now and we will see you on the 31st of October at Theater Amsterdam! Check het programma, de achtergrond en meer over TEDxAmsterdamED en/of lees vooral hieronder vast een van hun blogs. You may or may not have noticed it, but nowadays we come across more and more articles about ‘Dutch national characteristics’, which would pre-eminently offer many future opportunities. As I understand it, Ricardo Semler was the first to publicly state that the Dutch qualities were an especially suitable set of characteristics to encounter ‘the complex future’. In his new book: Tot hier en nu verder, Cees van Lotringen searches for the Dutch essence: the DNA of his homeland. He discovered that the Dutch have certain values at their disposal, that enabled them to establish a new Golden Age. Van Lotringen was inspired by the British historian Simon Schama, who also started a search for the DNA of the Netherlands. We, TEDxAmstedamED are convinced that what we call Dutch DNA, (mainly because of the alliteration), can play an important part. Besides historical clues, we came to this belief based on observations in the education sector. Before we can further examine Dutch DNA in education, we will explore and define Dutch DNA from a historical perspective: development of the Netherlands. A clear warning beforehand: the behavior of Dutch people through the ages, resulting from that ‘Dutch DNA’ has led to many good things but also to many bad things. When we say in this article that we, like others who have noticed this, are enthusiastic about the Dutch DNA, we mainly mean the possibilities this has for education and the complex problems that arise, and emphatically not all bad things that originated from the same Dutch DNA. To cut right to the chase, we believe the geographical position of the Netherlands is the source of the prominent Dutch characteristics. A flat landscape that borders the North Sea with many rivers streaming upwards into the country. It really is that simple. All credits to go to our famous historian Johan Huizinga, who for the first time showed a relationship between Dutch characteristics and the geographical position of the Netherlands. As mansion owning merchants became the Dutch equivalent of castle owning knights, the Dutch never knew nobility, or the corresponding feudal system, like they did in Germany or Britain. Early on, the Dutch developed into a more egalitarian character than the surrounding European powerhouses. For ages, the guilds predominated the cities. Anyone could theoretically become a novice and work his way up to master/expert level. Equal opportunities for everyone! Common sense for trade and commerce (that goes perfectly together with Calvinism, the ‘dominee en de koopman’ (the ‘pastor and the merchant’) explains why the Dutch wars were rare. The majority of the battles, in the Eighty Years’ war, mainly fought by mercenaries armies, were situated far from the conurbation of western Holland, which was the economical centre of the Netherlands. During World War I, the Dutch remained neutral and they would have liked to have remained neutral in the World War II as well: ‘war is bad for the economy!’ In addition, unlike e.g. Germany, the Netherlands has not experienced traumatic civil wars. All of these phenomena resulted in an optimistic attitude throughout the general public. The imfamous complaining and moping we know today only came about in the last two decennia. The downside of this ‘neutral’ attitude was the absence of romantic literature and music. However, the painting industry did get a chance to bloom because any well-faring merchant wanted to eternalize him/herself on a canvas. In the everlasting battle against the water, polder-management was the big issue. Land owners had to figure it out together. This difficult ‘polder-management’ enforced the ability to work together and make compromises. During the golden age (also a result of the geographical position) the Netherlands achieved great levels of entrepreneurship in shipping and trade. Incidentally, that same Dutch DNA has led to enormous abuses such as slavery trade and colonial repression, (cases that to this day, the Netherlands has not apologized for). In addition to many profits, this entrepreneurship also generated a sense of self-awareness and creativity. Throughout time, that sense of self-awareness has diminished, but has settled not too deep in our subconsciousness, not in the least because of a ‘striking appeal’ from Prime Minister Balkenende. These historical developments had a big influence on the autonomous and outspoken people the Dutch are today. People that are unruly of hierarchical constructions, that can efficiently work together using the ‘polder model’, is creative and is entrepreneurial. In a nutshell, that is what Dutch DNA has become: a set of virtues that has apparently drawn the attention of national and international trendwatchers and visionaries who believe these characteristics are exactly what someone may need in the 21st century to take on the future. Long story short, most Dutch children are the embodiment of Dutch DNA. They are outspoken, autonomous mini-citizen, that are used to paving their own way and being deliberate. The individualization process after WWII and the famous sixties increased the forming of an egalitarian society, whereas equality became our wealth. We need even more outspokenness and more autonomy, let’s see what Dutch DNA can do for the Dutch educational system. The current educational system and Dutch DNA can barely withstand one another anymore. The educational system, that we inherited from the days of the industrial revolution, is aimed at the efficiency of a uniform 30-children classroom. It cares little for individual needs, differentiation or highly intelligent children. ‘Behave normally, it is crazy enough’, is a typical phrase that comes from the period. Many aspects of the educational system have already been changed. Many schools and school boards are experimenting with various new forms of education, for which the ministry finally gives room after three decennia of top-down regulation. We have to ask ourselves whether these changes do not come too late. Even though Dutch children are the happiest kids in the world and the Dutch educational system still holds up in the top 10 of best education, there is talk of alarming developments. In many schools we experience students and teachers struggling with the style of classroom-management: with uniform curricula, hierarchical order and not enough creative outler. I remember what my daughter (HAVO 5), who barely receives classroom lessons anymore, saying: ‘Dad, this teacher cannot keep order. Another teacher can, but he cannot explain well. And the third one smells. We are not going to listen to them!’. In reaction, teachers started saying: ‘please go and work autonomously and tell me when and if you have questions’. My other daughter (also HAVO): ‘Dad, we are not going to wait for that teacher anymore, it is sad, but he cannot do this. We search for a teacher on YouTube, that can explain it far better. We politely and urgently ask the class-nerds (which is not always an insult anymore) to make summaries. We are studying for a test with six girls on skype and we pass the test. That is how we do it nowadays.’ Need I say more? Dutch DNA in optima forma! Unfortunately, these are frugal exceptions. However, there are more: we know schools, for example the IJburg College, where there are many outspoken and autonomous students. They contribute to their own learning route and curriculum by choosing the learning pace, choosing test-methods, choosing the way they learn, and choosing their own topics. And there are more schools that are well on their way. At the same time, we believe the system is changing too slowly. In other words, the student of today is desperate for education that is able to change much quicker. Flexibility, differentiation and pluriformity are missing. This has to change before it is too late. Some schools barely have classes/lectures anymore, the decline in students’ level of motivation is worrisome and keeping order becomes harder and harder. The individual potential of the outspoken and autonomous student is for the most part unused. Still, I agree with the trendwatchers. As stated before, there are huge opportunities for the Dutch educational system if we manage to redesign the system in such a way that the typically Dutch qualities, the Dutch DNA is used at its full potential. When a student, obviously with intensive individual accompaniment of a teacher, gets enough room and freedom to put their drive and creativity to use, then the Dutch could be climbing up the ranking, instead of slowly dropping. They could be an example for modern education, but also for how a country prepares its children/students for the complex future that is in front of us. Then those trendwatchers will be right after all.